Fire extinguisher that activates itself?? Good fun! Pretty sure I just bought one, but I assume that the recently made ones are ok? No good. I saw that this morning. I think I have more than 4-5 of those small plastic handled ones. Hmm recall date is February 12, 2015. I assume all after that date is good to go. ^ Not sure. I tried to go to their website for more details but it’s not working well today for obvious reasons. I got the PDF, it's at best slightly confusing. It shows how to read the model number and serial number, and then has a list of model names/numbers. It does clearly seem to include models made up through 2017. ^ When I saw this on the news this morning, my first thought was all of our SMBs because I'm sure we all have extinguishers in our vans. Mine is definitely a plastic handle one. Now that I think about it, it's probably time to replace all of ours...home, garage, etc. They don't stay fresh forever. Man, I can't afford this hobby anymore! First, my lifetime maintenance-free propane tank is going to explode after I drive 500 miles to find a guy who will fill it and now I won't be able to put out the fire! That after my batteries, which I have 10 of in the van, explode due to off-gassing simply because I fire up a stogie in the comforts of my own mobile-home? Oh, wait, I switched to lithium. Those are a lot safer. No problem! I got them cheap from some aircraft salvage place after the airline went bankrupt. Lawsuits or something, I dunno. I got one of those new fangled Samsung smartphones too. I'm not worried about it, though. I mean, I usually fry and egg on it in the morning while it's charging, but is there really a risk? I usually go outside the van while my egg is frying on my charging phone and get some exercise riding my Chinese made hoverboard around. No risk of fire there. I sure am glad I wired my van with this scrap aluminum wiring I got cheap at the salvage place! It came out of a mobile home that caught fire, the guy said, but the fire was at the other end. Cough, cough. They say I shouldn't smoke these stogies anymore anyway, seeing as how I carry around a portable oxygen tank nowadays. Something about the pure oxygen, you shouldn't have open flames near it or something. I dunno, I didn't read all the fine print. Well, I'm going camping. I hope you guys have a nice weekend. I got this new firestarter called 'Coleman lantern fuel'. The guy at Walmart helped me pick out a squirt gun and I thought it would be fun to just fill it full of this fire starter stuff and squirt it at the fire every now and then when it's dying down. I'll have one of these fire extinguishers ready. I've got 6 or 8 of em so even if they don't work all that well statistically I should be good, right? 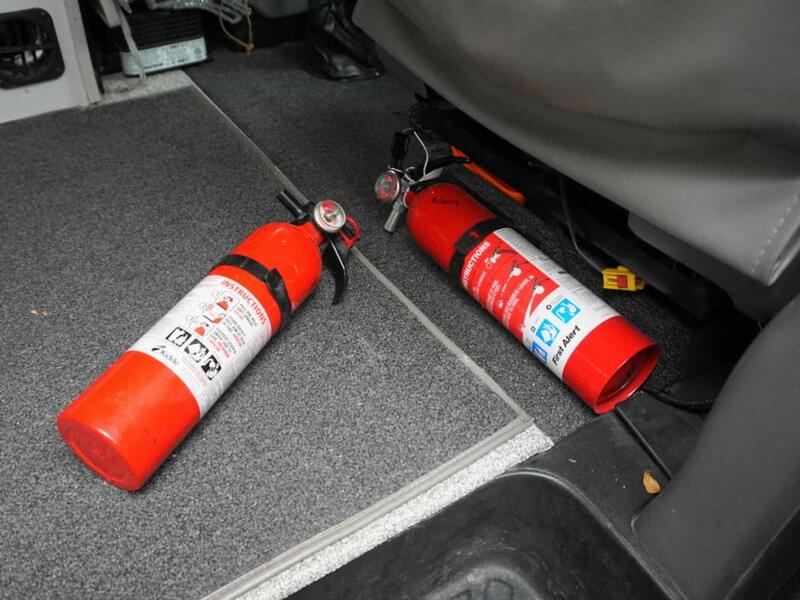 I just replaced my original 2005 plastic Kidd SMB fire extinguisher in June. I know, way, way too long before replacing. Went with a First Alert from Lowe's only because I was standing there the day I thought about it. 86Scotty, That's funny. But statistically the van will get destroyed and I will get hurt by someone crashing into me while driving than anything else. Amazon just sent me a notice since I bought it from them.